Maari Carter is originally from Winona, MS and attended the University of Mississippi where she received a BA in English. 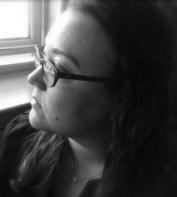 Her work has appeared in Stone Highway Review, Steel Toe Review, and BOILER: A Journal of New Literature. She lives in Tallahassee, FL where she is Business & Promotions Director for The Southeast Review and hosts The Warehouse Reading Series. She is currently pursuing an MFA in Creative Writing at Florida State University. across asphalt that knew the skint meat of knees. down his arm one February day I always get wrong. to our yard, but can’t show them where we live. I stop cokefucking our friends. her stone cheeks. You say my eyes are a hoax. as you pried your name from the mailbox.